I've only found this saw on eBay twice in the three years that I was on the look-out for mine. In the end I didn't even find mine on eBay after all. This saw was made to mount on one of Shopsmith's single or double SPT stands and was sold under the name Shopsmith and PowerKraft by Montgomery Wards. When this saw is mounted on the double stand, it can sit beside the Shopsmith 4" jointer and the two tools share a common motor with a double shaft and two different size drive pulleys. The second photo is from the patent for another Magna saw that features a sliding table for cross cutting. I'm unaware if Magna ever produced it. As usual these guys were years ahead of their time! Click on pic to Biggie-Size it. 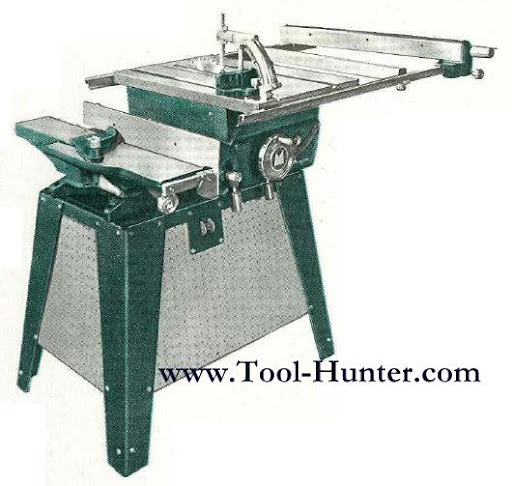 1956 Magna-Line 9" Tilting Arbor Table Saw Ad "Magna Offers America's Finest Tilt Arbor Saw!" 1956 Magna-Line Tablesaw and 4" Jointer Ad "MAGNA 9-in. Saw with "The Helping Hand"
1957 Magna-Line Tablesaw Ad "Why Magna?"